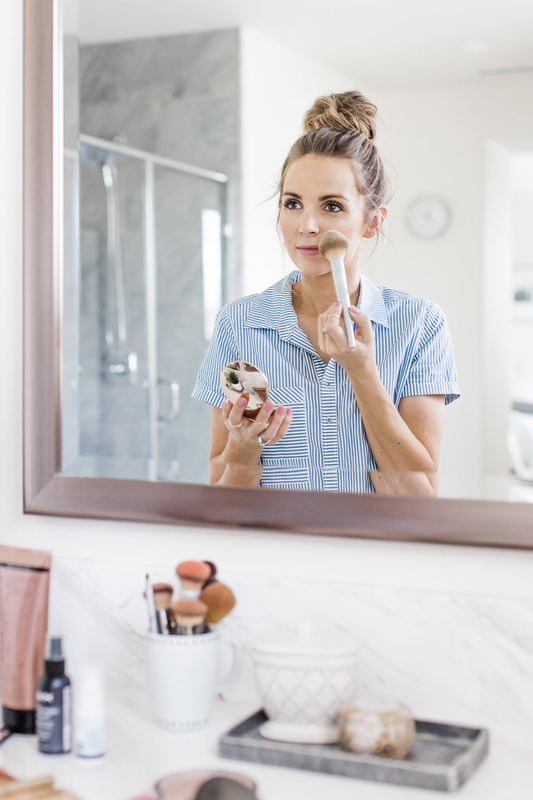 Over the last few years I’ve been trying a lot of different beauty products and skin products. Pregnancy hormones do crazy things to my skin, so I’ve had a lot of different skin issues that I’ve been dealing with. 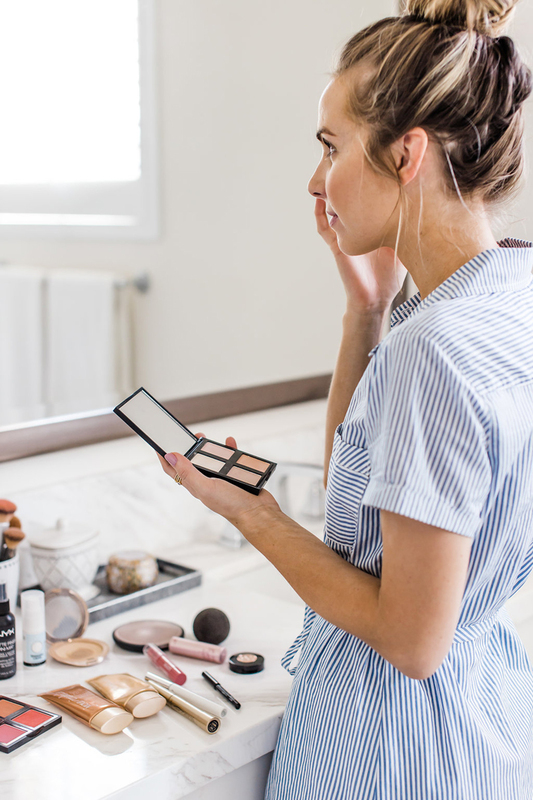 I want to share more about my skincare routine soon, but today I’m sharing my favorite makeup products that I use for my everyday makeup look. 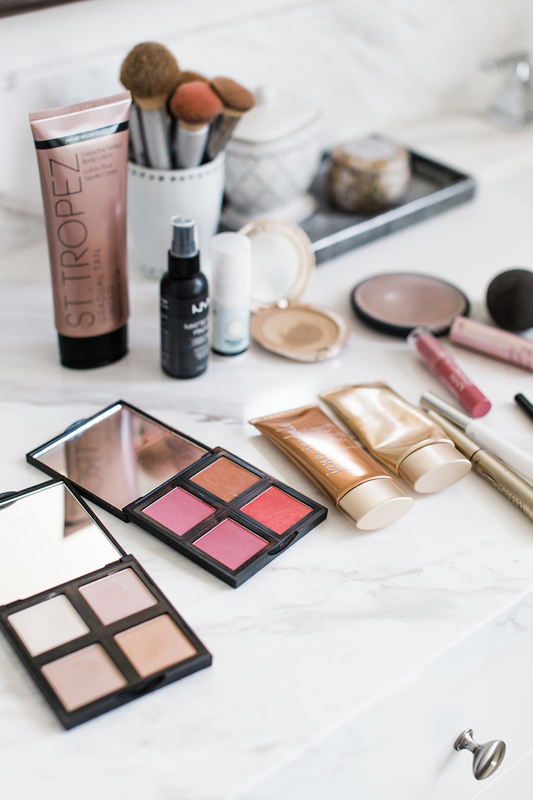 These are all the products that I use and love! I had been using Clinique foundation for a few years, but lately I felt like it was clogging my pores. 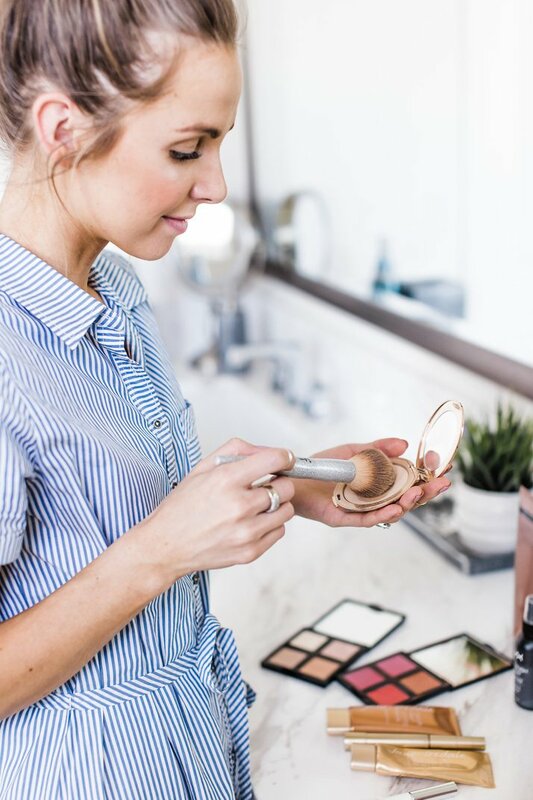 My esthetician recommended Jane Iredale makeup, and after one day of using it, I was in love. It’s a BB cream and powder foundation combination, which I wasn’t used to at first, but I ended up loving. The BB cream is super lightweight but it’s very pigmented. I use about a pea size amount for my entire face, dabbing it in various areas and then using my fingers to roughly spread it around. Then I use my Beauty Blender to blend it in. Make sure you get your Blender completely wet, then squeeze it out, then dab all over your face to blend (no swiping!). The pressed powder gives amazing coverage without being heavy either. You can put on a little or a lot depending on your preference or coverage needs. During the summer, I just put a little over my BB Cream to keep any shininess away and cover any blemishes. Next is brows. I have used Anastasia’s duo brow powder for several years and I love it. It’s pricey, but it lasts me over a year because I use just a tiny bit each day. My biggest challenge with filling in my brows was finding a powder that wasn’t too warm (which makes filling them in obvious). I use the “Dark Brown” color and if you use a small angle brush to apply, it looks really natural. I like a little flush of color on the lower apples of my cheeks to brighten my face a bit. I’ve used tons of blush over the years, and currently like this one from e.l.f. I use a mix of the two colors on the right side of the palette. I’ve become a firm believer in highlighter the last few months. It creates such a freshness and glow to your skin. I’ve tried a few over the years and just discovered this illuminating palette from e.l.f. I use the top left corner and it’s a really gorgeous highlighter, and goes on so smoothly without any caking. 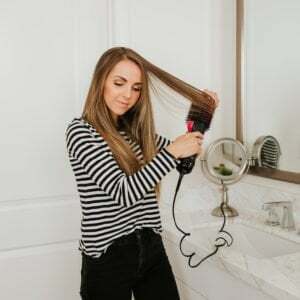 It just creates the perfect shimmer! I use my ring finger and just dot it across my cheekbones, brow bones, and on the bridge of my nose. I did an entire post on my lashes last year, and another post about my favorite beauty products here. 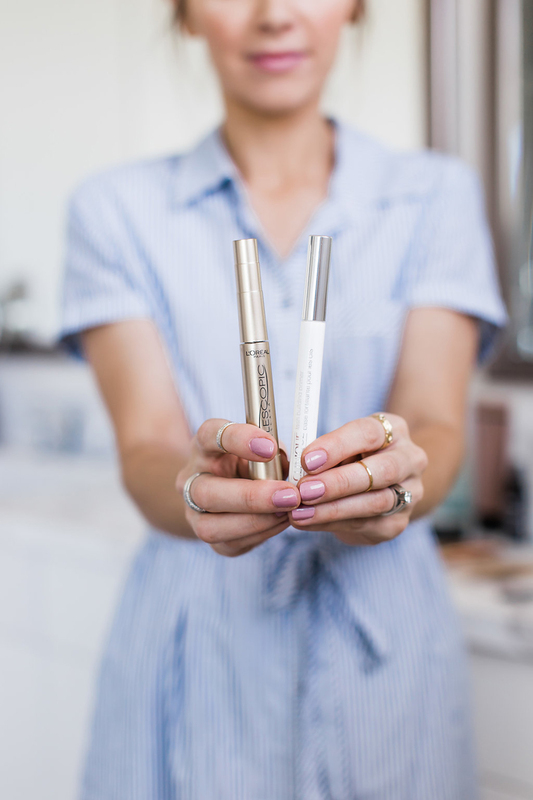 I use Neulash serum to grow my eyelashes and have had amazing results, which you can read about here. It’s currently on sale 2-for-1 here!! I use a white primer mascara first on my lashes, and then go over it with L’Oreal’s Telescopic Mascara. I hardly ever do eyeliner or eyeshadow in the summer. 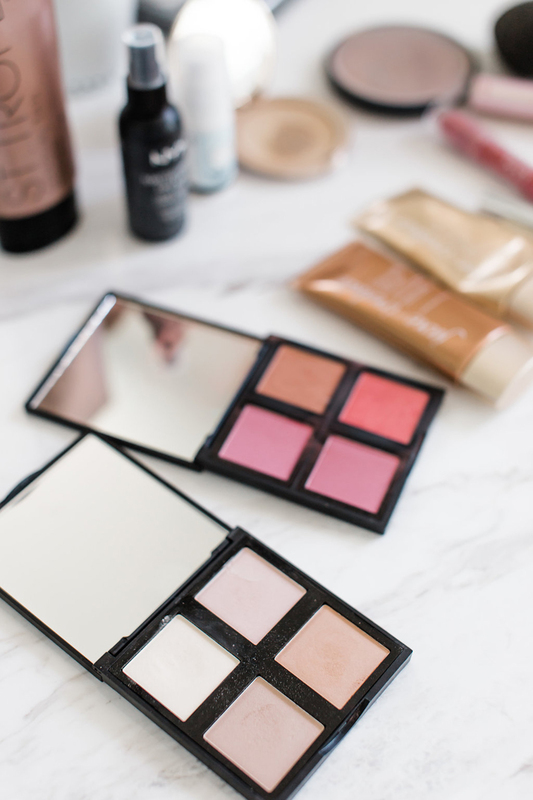 If I do want a little color on my lids, I use the bronze color in my blush palette. In the summer when it’s hot outside, I always worry I’m going to sweat my makeup off. Did you know they’ve come up with a solution for that? Setting sprays! I’ve heard great things about this one from Urban Decay, but I found this one from NYX for a fraction of the price and it works really well. I’ve said it before, but I’m not a huge lipstick wearer. Especially during the summer, I like a really neutral lip. One of my very favorites is It Cosmetic’s Je Ne Sais Quoi Lip Treatment. It activates your lips to produce you very own flushed color. It always makes mine a perfect light pink, and it hydrates like no other. If I do want a little extra color, my current favorite is NYX’s chubby stick in “watermelon cooler.” I also did a whole post on the best neutral lip colors right here. Are you saying you put on makeup after washing your face to go to bed? Can you clarify? Sorry that was confusing! I just put the tinted moisturizer on before bed so it can set overnight. It’s my last step in my night routine. Then the next day I have a good base color for my makeup. Does that make sense? Sort of, although I’m personally not a fan of sleeping with anything other than a moisturizer on my face. Does this mean you don’t wash your face in the morning? I do wash my face in the morning! I just like to give the color a lot of hours to set. 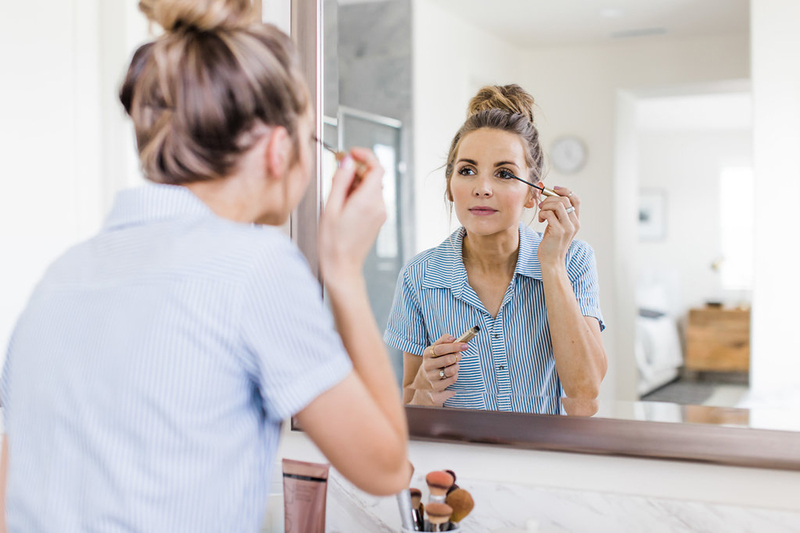 You could do it in the morning instead before you put on your makeup — I do that sometimes too! But it’s just a lotion so it shouldn’t feel like anything extra when you’re going to sleep. Hope that clarifies! It’s a dress from Abercrombie! Sadly it sold out earlier this year. Your dress is beautiful. Who made the dress? It’s from Abercrombie earlier this year — sadly sold out!! If you love the Jane Iredale foundation you should try their hydration spray which works as a setting spray – so good!